By Sarah ChurchwellFor most of Laura’s childhood, she lived in close proximity to drunks, rapists, horse thieves, adulterers and more than one murderer, including perhaps a brush with a notorious family of serial killers. Nor was the Ingalls family’s progress a simple westward expansion, as the novels more or less report it: Wilder deliberately simplified their back-and-forth journeys across the midwest in order to create the impression of westward progress, an image in keeping with her theme of nation-building. In fact, the Ingallses retreated east more than once, while the self-styled “pioneers” were land-grabbing as fast as they could: manifest destiny was a giant get-rich-quick scheme. The family emerges as far more opportunistic, even on occasion unscrupulous, than the whitewashed novels would have us believe. Charles Ingalls knew that he was in Indian Territory illegally, while his wife’s brother Tom went to the Badlands on an ill-fated and illegal search for gold. The family snuck away from debts on at least one occasion, making their escape in the middle of the night. The fundamental drama in the novels comes not from conflicts within the family, but with the external forces of government, Indians and nature. Of the three, the last is the one we are most apt to sympathise with today; the attitude of the settlers to the Indians makes for uncomfortable reading (“Treaties or no treaties, the land belongs to folks that’ll farm it. That’s only common sense and justice,” one neighbour declares). It is an attitude that the Ingallses and their relatives clearly shared; many of their actions were in flagrant violation of treaties. The most extensive difference between the two accounts is Wilder’s decision to excise an entire interlude in Iowa from the novels. The family’s retreat to the east undermined her triumphalist tale of westward progress, but their time in Iowa also featured some of the family’s grimmest experiences. 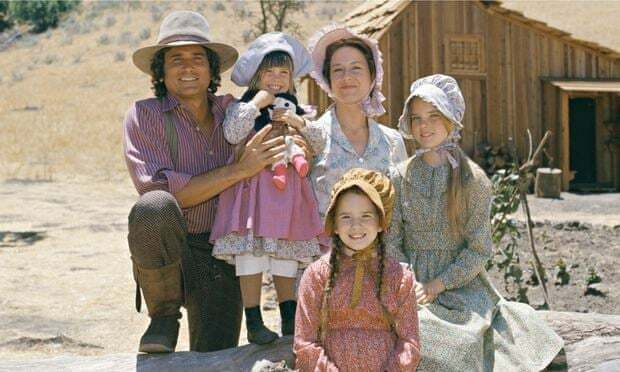 They lived in a hotel adjacent to a saloon, which is hard to imagine the fictional Ma Ingalls permitting; the decision was a mark of their “financial desperation,” as the editor of Pioneer Girl notes. There were bullet holes in a wall, made by a drunken man shooting at his wife; another dragged his wife around by her long hair, carrying a lamp that was pouring kerosene; Charles Ingalls intervened to keep them all from being burned to death.Comment: For more on Little House on the Prairie, see Little House = Libertarian Fable and Little House Celebrates Land Theft. Another response to the Deadline Hollywood article points out that diversity isn't just good morally. It's good financially, leading to better ratings and more revenue for broadcasters. By Jeff YangHunt warns that like prior TV flirtations with diversity, this progress could be temporary. Yet the numbers—the only things that matter in Hollywood—show that this time, something different may be happening. Out of the scripted shows with all-white leads introduced this past season, just one—a reboot of “The Odd Couple”—seems guaranteed a renewal. Meanwhile, nearly every series centered on diverse characters looks like a solid return, for two reasons. The first is that they’re expanding network audiences in ways that reflect the new demographic reality. Analyses provided by Nielsen show that the three most-watched non-event shows among 18-49 year old Asian Americans as of February were “Fresh Off the Boat,” “Fresh Off the Boat” and “Fresh Off the Boat”—and it’s not even close, with Asian Americans being twice as likely to watch FOTB as any other scripted program. A full third of all 18-49 year old African Americans watch “Empire” each week, making it more popular than the Super Bowl in that demographic. And 17 of the top 25 shows among 18-49 year old Hispanics are on Univision—the Spanish-language network that regularly draws bigger audiences than Fox and NBC. Ultimately, points out UCLA’s Hunt, “we live in a diverse society, and people want to see stories that reflect that. We’re curious about other groups’ experiences. It shouldn’t come as a shock that white households don’t only want to see shows with just white people.”Comment: For more on the subject, see Where Are the Native TV Shows? and Deadline Hollywood on TV Casting. Author Yvette Nolan and director Nina Lee Aquino decided to find their ideal cast for Factory Theatre/Native Earth production, regardless of race. By Richard OuzounianWhen Caucasian actress Allegra Fulton was offered the part of an aboriginal woman in the Factory Theatre/Native Earth production of The Unplugging, her negative reaction was immediate. But a trio of influential voices kept trying to influence her: the director of both Factory Theatre and the production, Nina Lee Aquino, well known for her work in multiracial theatre; Ryan Cunningham, the artistic director of Native Earth; and the show’s author, Yvette Nolan, herself of mixed Algonquin and Irish heritage. Then she remembered what playwright Tomson Highway had said to her years before when she was offered a major role as a Métis woman in a TV series and expressed similar qualms. By Kim Wheeler“We talked about the casting, made a list which included not only the indigenous actors ‘of a certain age’ but actors from the larger multicultural community,” said Algonquin playwright Yvette Nolan, who made casting decisions along with director Nina Lee Aquino. “There are not that many. For many reasons—attrition, retirement, fatigue. Many of the women on our list were already working in other shows or in movies or on much bigger projects." When Columpa C. Bobb, an actor, writer, director and producer, heard about the casting decisions she created a long list of female indigenous actors on her Facebook page. That started a discussion among the acting elite--including Tantoo Cardinal who was recently selected by ACTRA for the award of excellence. “I don't care how talented you are, you will never convince me you are Indian. I have not seen a non-Indian actor catch nuance that needs to be there,” said Cardinal in a phone interview.The problem isn't limited to one play:Playwright Ken Williams said his first mainstage production of Thunderstick—which went on to star Cree actor Lorne Cardinal and Anishinabe actor Craig Lauzon—had the same problem in 2002. “We had the Isaac role cast but not one of the actors I wanted for Jacob were available. We ended up casting a non-native person for the role,” said Williams. Drew Hayden Taylor's play, God & the Indian, will be the next Native Earth production. He's had over 70 productions of his work produced by several theatre companies. Hayden said that on at least two occasions theatre companies have had to hire non-indigenous actors for his plays. “I would rather have had a Native actress do the role, but as an artist, I would rather have a talented and experienced actress bring life to my characters than just somebody with a status card who's never acted,” said Taylor, who also saw The Unplugging.Comment: I don't think Native Voices at the Autry, here in Los Angeles, has ever experienced this problem. But it has a huge pool of Hollywood actors, including Natives, to draw on. These articles don't quite address the core issue. Native Earth Performing Arts is supposedly a "professional Indigenous theatre company." Okay, then it should have developed a pool of talented Native actors in the Toronto area. In fact, Native Earth shouldn't exist unless it has a critical mass of Native actors, writers, directors, and so forth. What's the point of a Native theater company if you don't have enough Native people to put on Native plays? I trust Native Earth has addressed and answered this question. Perhaps the article writers didn't have the time or space to go into it. But the question is central to the Unplugging controversy. 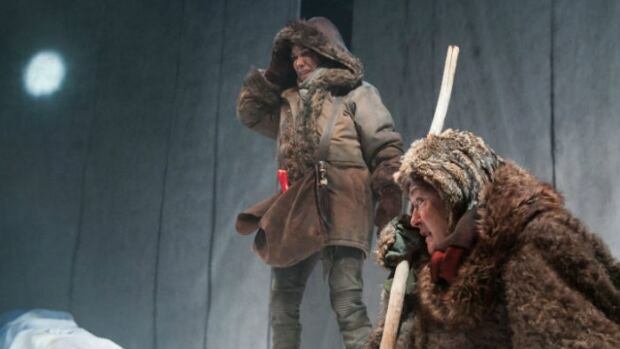 Does Toronto have enough Native actors to put on Native plays or doesn't it? If it doesn't, what is Native Earth doing about it? If Native Earth is building an ensemble of Native actors but still can't find two of them for The Unplugging, it may be in the wrong business. For more on Native theater, see Off the Rails at Native Voices and Stanford Cancels Bloody Jackson Play. By Nellie AndreevaThere was a noticeable shift toward minority castings last season, with more parts opening up to ethnic actors, a casting term used for non-Caucasian thesps. It was a concerted effort, with more than one instance where a family member role was rewritten as adopted to make them ethnic. 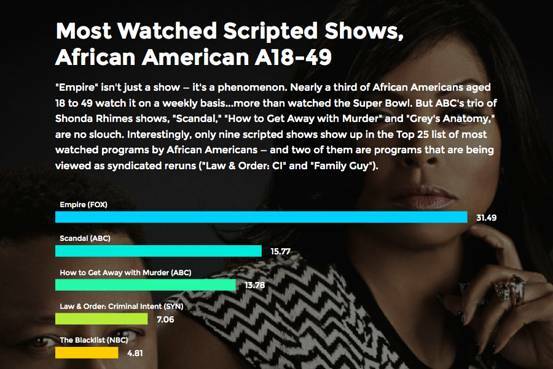 Then, following the success of freshman series How To Get Away With Murder, Black-ish, Fresh Off The Boat, Jane the Virgin and especially Empire, which launched to huge ratings at the kickoff of pilot casting season, ethnic castings exploded this season. The change is welcomed by talent agents who no longer have to call casting directors and ask them if they would possibly consider an ethnic actor for a part, knowing they would most likely be rejected. “I feel that the tide has turned,” one agent said. “I can pitch any actor for any role, and I think that’s good.”It started off fine, but then veered into troubling waters with these paragraphs:This is not to say that there weren’t other hot commodities this pilot season—star names were in demand as usual, as were hot young guys and girls and occasional foreigners with that “sparkle.” But the big trend this pilot casting season was the huge spike in the number and prominence of roles that went to minority actors. But, as is the case with any sea change, some suggest that the pendulum might have swung a bit too far in the opposite direction. Instead of opening the field for actors of any race to compete for any role in a color-blind manner, there has been a significant number of parts designated as ethnic this year, making them off-limits for Caucasian actors, some agents signal. Many pilot characters this year were listed as open to all ethnicities, but when reps would call to inquire about an actor submission, they frequently have been told that only non-Caucasian actors would be considered. “Basically 50% of the roles in a pilot have to be ethnic, and the mandate goes all the way down to guest parts,” one talent representative said. By Joshua AlstonLast night, the Hollywood trade publication Deadline convened a small group of concerned Studio City citizens to nibble on finger sandwiches, crudites, and ambrosia salad and have a frank discussion about the…*ahem*...changes in the neighborhood. Y’know, how the...um...tone of the television landscape has shifted in recent months. Okay fine, if we have to come out and say it, Hollywood is unsettled by the influx of “ethnic actors” on television. But it’s not about prejudice or anything like that. People are justifiably concerned about property values! By Arthur ChuIn every happy story there is always an unseen victim, someone who gets rained on by everyone else’s silver lining. You might think that the news for primetime TV in 2015 can only be good–audiences are celebrating the wave of smart programming with diverse ensembles both in front of and behind the camera. And far from having to make some virtuous financial sacrifice at the altar of diversity, the network suits are cleaning up. Over-the-air primetime TV has never felt more vibrant or relevant, even as “alternative” streaming platforms continue to thrive. “Empire” has shattered records and reclaimed the eyeballs of the Twitter commentariat from “prestige” cable channels. Nostalgic for the good ol' TV days of "Friends" and "Seinfeld," insiders are whining about "unfair" "ethnic quotas"
2nd Reaction: Article is so ignorant I can't even be bothered. We still have so far to go to see underrepresented cultures on screen & @Deadline is like "these last 3-5 years should be enough, right?"
. 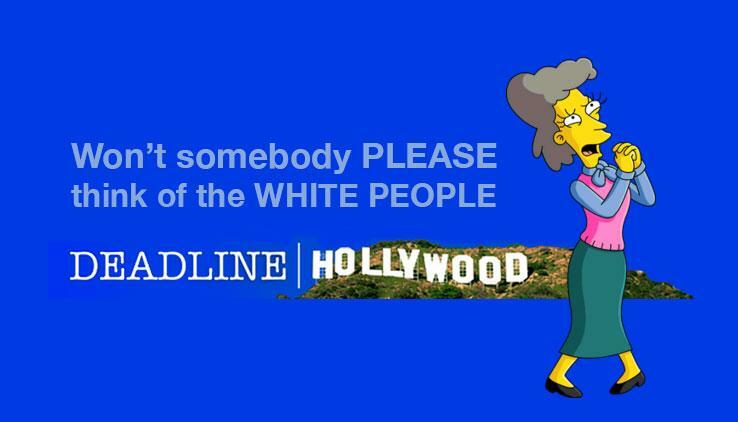 @Deadline You are literally creating the problem when you label TV a white person's medium and suggest non-whites are a trend. Has the pendulum swung too far in the direction of TV representing the world how it actually is???!!! !Comment: For more on the subject, see TV Starts to Reflect America and White Males Still Dominate Hollywood. By Eisa Nefertari UlenBuoyed by the success of ABC's "Modern Family," television has developed projects that more accurately express who we are. It is glorious and wonderful and mostly just fun. Shows like "Fresh Off the Boat," "Blackish," even "Empire," "Scandal" and "How to Get Away With Murder," do more than just center people of color in each 30 or 60-minute time slot, and also do much more than accurately reflect how we look. These shows also express a refreshing diversity in terms of how we think, how we feel, even how we parent in non-White families and, often gloriously, perfectly hilariously, these shows center how we be. Why Can’t We Stop Watching ‘Empire’?What is it about “Empire,” the Fox series about a family of music moguls that wraps up its first season this week, that makes the show so addictive? It might be the juicy plotlines; Taraji P. Henson’s ferocious and charming portrayal of Cookie Lyon, the estranged matriarch of the family; the so-bad-it’s-almost-good soundtrack, produced by Timbaland; or some combination of all three. The soapy drama, which debuted in January, was the highest-rated new series on television this season. Its ratings and audience numbers have risen each week the show has aired—a phenomenon that is practically unheard-of. Fox has already renewed the series for a second season. The appeal of “Empire” is widespread—roughly 15 million people watch every week—but according to Nielsen, the show resonates particularly strongly with black viewers, who make up 62 percent of its primary audience. NPR’s Code Switch blog called the “Empire” success a “particular achievement for a show with an almost entirely black cast.”Below: Bryshere Gray, Terrence Howard, Trai Byers at the FOX TV "Empire" Premiere Event at a ArcLight Cinerama Dome Theater on January 6, 2014 in Los Angeles, CA. By Rob SchmidtAt Mile 17 of this year’s Los Angeles Marathon, held March 15, runners saw and heard something a little different: a powwow dancer and a drum group. It was a subtle reminder that they were on Gabrielino Tongva land—and that the land’s first inhabitants are still here. For the second year in a row, the American Indian Community Council (AICC) was an official race sponsor. AICC is a central hub and resource for LA’s American Indian/Alaska Native community. It operates groups for women, elders, and the Indian Child Welfare Act, among other things. AICC’s 2015 goal was to raise funds for United Native Youth of LA (UNYLA), which represents LA’s Native youth councils. Specifically, AICC plans to send Native youngsters on a Youth Leadership Journey to nearby reservations to learn about their roots. Some urban Indians have never visited a reservation. The LA Marathon encourages participants to raise funds for causes. This spurred 27 Indians to run this year—up from only three a few years ago. They included long-time marathoners Shawn Imitates-Dog and Willie Sandoval as well as some first-timers. Nineteen completed the whole 26.2 miles while the others ran half-marathons in relays.Comment: For more on the subject, see Indians Raise Awareness at LA Marathon. Below: "Young helpers pass out water to runners in the L.A. Marathon at the American Indian Community Council's water station." Some Goodreads comments give a more realistic picture of the book:Found this weeding the library's collection and its title cried out to be read. Another hidden gem. 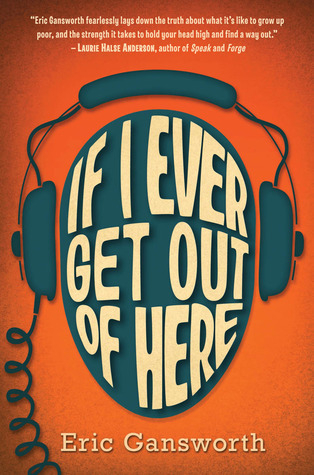 A collection of disparate essays on being Indian and about their place in the world. I enjoyed the first third of the book more than the remainder which discussed art and Indian artists. Smith is witty, cheeky and is all over issues, debunking stereotypes, endorsing stereotypes. You never quite know what he's thinking or where he stands as his views have evolved over time. We have the Indian as: drunk, noble savage, victim, etc. Great writing and insight from a guy who never graduated from college. A really witty essay on irony. Smith grew up as a suburban Indian, was involved with AIM, and then becomes a curator at the NMAI. Go figure. I didn't have my mind blown by this book, but it was an interesting look into the mind and identity conflict of modern Native Americans. I especially liked the parts where they talk about within the Indian community, classification by tribe enrollment and blood percentage. Parts I wanted to enlarge and hang on the wall or send to friends and family, they were so spot-on and funny and provocative. Others I found myself skimming. Maybe because it's a collection of previously released essays so there was some repetition, and also because some were written for museum exhibits. The great parts made it worth it, though. Unfortunately, this book turned out to be a series of essays and lectures from the curator of the Smithsonian's National Museum of American Indians. Although parts of it were indeed about the incorrect portrayal of American Indians in history books and movies, much of it was about current Indian artists. I was hoping to be educated about real American Indians but was not. I was least compelled by the middle of the book, where each chapter was clearly originally written as an introduction to an art show with which Smith was connected (as writer or curator). There's a fair bit of repetition between the essay, and the words would be stronger if they ran alongside more examples of the art Smith's referencing. Still, there are some wonderful gems of insight, mockery, and politics in these essays too--very well worth the read.Comment: I agree that Everything You Know is too much about the art world to be of general interest. The ideal reader is probably a museum-going, art-loving Indian like Smith. The rapper Common made waves during a recent appearance on The Daily Show with Jon Stewart when he offered his take on race in America. It isn’t nearly so simple. By Stereo Williams“The New Black dreams and realizes that it’s not pigmentation: it’s a mentality, and it’s either going to work for you or it’s going to work against you. And you’ve got to pick the side you’re going to be on,” Pharrell said. His words were laughably empty and insulting to the current climate, the history of black ambition in the face of tremendous cultural oppression, and the reality of institutional racism; but they also represented a vocal cadre of black celebritydom that is calling for the black community to basically “get over it.” With the racial conversation in the national spotlight, stars like Williams, Kanye West, and others aren’t addressing racism in as much as they are deflecting the conversation. Common, while not countering Stewart’s statement, offered his perspective on the way to heal wounds that have existed on American soil for centuries. Celebrities like Common and Raven-Symone are but ambassadors of the growing New Black culture that Pharrell became the unwitting poster child for in his now-infamous Oprah interview. “Upward mobility,” sayeth the New Black, “that is the promise of America and because I have achieved—you can, too.” They conveniently romanticize their climb to wherever they are in their lives and careers, telling themselves that they got there via personal drive and ambition that is unique to them. But structural obstacles kept most of their peers stagnant in socio-economic standing; these stars achieved in spite of racism—not because it doesn’t exist. So it is dangerous to put the onus on the oppressed people, as if you believe no one cared to climb the ladder until you came along. Poor public schools and overpriced housing mean that things aren’t really designed for you and your peers to “make it out.” You can’t be “exceptional” without being an exception. The New Black perspective sounds like an old black pathology. Exceptionalism and respectability have never saved us from the oppressive weight of racism. We’ve always achieved greatness in a country that doesn’t see value in blackness beyond a commodity; maintained dignity in a land that has consistently dehumanized and stigmatized who we are. White supremacy often insists that black people prove themselves exceptional just to share a table with white mediocrity. It is not for black people to extend a hand; it is for the privileged and the powerful to remove their boot from the community’s collective neck. These celebrities seem to be disconnected from the pulse and spirit of many of their peers, but their voices resonate far and wide in pop culture. And more black celebrities should take the struggles of the community at least seriously enough to not offer condescension, rhetoric, and smug dismissals when confronted with the realities of race and racism. Those with the biggest pulpits can’t continue to preach the gospel of positivity, condescension, and denial. It was deflecting when Bill Cosby gave his infamous “Pound Cake speech” in 2004 and it’s deflecting now. It’s an old routine. By Mesfin FekaduAP: Common received some backlash for his comments about ending racism on "The Daily Show" last week. What are your thoughts? Legend: Oh yeah, I heard a little bit about it and I understand what he's saying because I do believe that part of us ending racism is us seeing each other's humanity and learning to love each other, even if we look different or worship differently or live differently. But I think it's not enough for us to extend the hand of love. I think it's important that that goes both ways. It's important also that we look at policies we need to change as well. It's important for us also to fight for certain changes that need to happen. And one of those issues that I really care about is education. But also another one is incarceration, which is what I talked about at the Oscars. And mass incarceration is a policy that's kind of built up over the last four decades and it's destroyed families and communities, and something we need to change. And it's fallen disproportionally on black and brown communities, especially black communities, and it's kind of a manifestation of structural racism. So when you think about that kind of thing, it's not enough to say we need to love each other, you have to go behind that and say we need to change these policies, we need to fight, we need to protest, we need to agitate for change.Another posting shows how whites are happy to dismiss talk about racism--with the help of the "New Black" culture. By German LopezAs national debates about race and the criminal justice system heat up following the police killings of various unarmed black men, a new survey shows that black and white Americans are deeply divided on discussions about race. A YouGov survey of nearly 1,000 Americans found that 57 percent of white Americans think the nation spends too much time talking about race, while 49 percent of black Americans hold the opposite view. The majority findings don't necessarily reflect the opinions of all black and white Americans. 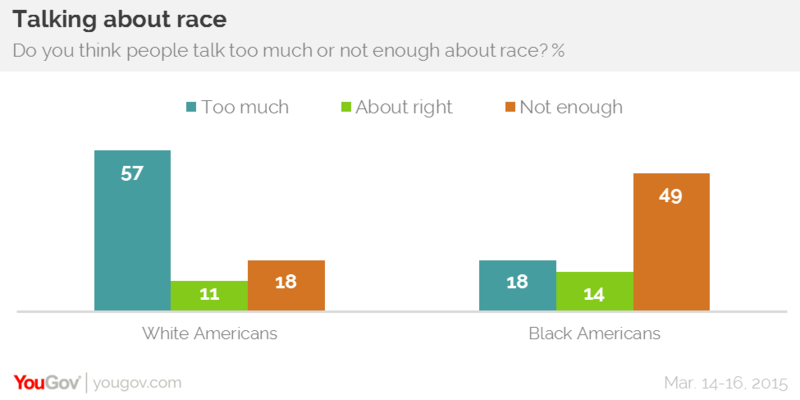 YouGov found some dissent within both groups: 18 percent of white Americans said people don't talk about race enough, while 18 percent of black Americans said people talk about race too much. Still, the findings continue a trend of surveys that show white people tend to see race as less of an issue than their black counterparts do. Previous decades of surveys from the Pew Research Center found that black Americans express lower confidence than their white counterparts in police's ability to treat black and white people equally.Comment: It doesn't have a label, but you see the New Black kind of denial among Indians too. Undoubtedly among other minorities as well. Everyone wants to fit in and get along rather than raise uncomfortable but important issues. For more on the subject, see Race at the 2015 Oscars and Pharrell Apologizes for Headdress. By Luke BrinkerThe harsh realities of American racism and how it functions are seldom acknowledged, Chomsky argues—the willful result of national myth-making and truth-shrouding. “There is also a common variant of what has sometimes been called ‘intentional ignorance’ of what it is inconvenient to know: ‘Yes, bad things happened in the past, but let us put all of that behind us and march on to a glorious future, all sharing equally in the rights and opportunities of citizenry,’” he explains. 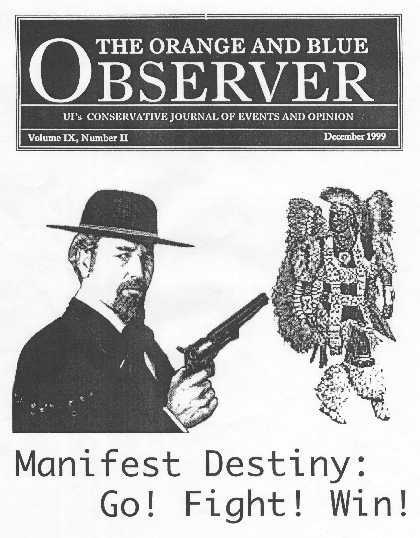 Intentional ignorance dates to the earliest days of settlement—when American colonists would reassure themselves that their displacement of Native Americans was part of a “humanitarian intervention” against “savagery”—and continues to the present day, undergirding discussions of African Americans’ alleged pathologies, for instance. By George Yancy and Noam ChomskyG.Y. : This “intentional ignorance” regarding inconvenient truths about the suffering of African-Americans can also be used to frame the genocide of Native Americans. It was 18th century Swedish taxonomist Carolus Linnaeus who argued that Native Americans were governed by traits such as being “prone to anger,” a convenient myth for justifying the need for Native Americans to be “civilized” by whites. So, there are myths here as well. How does North America’s “amnesia” contribute to forms of racism directed uniquely toward Native Americans in our present moment and to their continual genocide? N.C.: The useful myths began early on, and continue to the present. One of the first myths was formally established right after the King of England granted a Charter to the Massachusetts Bay Colony in 1629, declaring that conversion of the Indians to Christianity is “the principal end of this plantation.” The colonists at once created the Great Seal of the Colony, which depicts an Indian holding a spear pointing downward in a sign of peace, with a scroll coming from his mouth pleading with the colonists to “Come over and help us.” This may have been the first case of “humanitarian intervention”—and, curiously, it turned out like so many others. Knox went on to warn that “a future historian may mark the causes of this destruction of the human race in sable colors.” There were a few—very few—who did so, like the heroic Helen Jackson, who in 1880 provided a detailed account of that “sad revelation of broken faith, of violated treaties, and of inhuman acts of violence [that] will bring a flush of shame to the cheeks of those who love their country.” Jackson’s important book barely sold. She was neglected and dismissed in favor of the version presented by Theodore Roosevelt, who explained that “The expansion of the peoples of white, or European, blood during the past four centuries…has been fraught with lasting benefit to most of the peoples already dwelling in the lands over which the expansion took place,” notably those who had been “extirpated” or expelled to destitution and misery. That’s only a bare beginning of the shocking record of the Anglosphere and its settler-colonial version of imperialism, a form of imperialism that leads quite naturally to the “utter extirpation” of the indigenous population—and to “intentional ignorance” on the part of beneficiaries of the crimes. Turns out Trek isn't like pizza—when it's bad, it's just really really bad. By Ars StaffThe plot feels like the result of hours of sleepless brainstorming by a bunch of people on a rapidly approaching deadline—as if, at about 3am the morning the script was due, someone yelled out "GUYS, I've got it: let's do a deep criticism of colonialism and national policy by drawing a parallel between a Federation-Cardassian dispute and government land-grabs of the late 1800s!" And then, instead of shooting the idea down, someone else yelled "And we should have actual for-real Native Americans in it! We've had Nazi planets and Roman planets—we need a Native American planet!" And then instead of a third person punching the first two people in the face, they banged out the screenplay and turned it in and then all fell asleep at their desks. Actually, the person most directly responsible for this episode is none other than Ronald D. Moore, who also wrote some of the greatest TNG episodes (along with, you know, Battlestar Galactica and stuff). Moore's touch shines through in a few places—the scenes with Wesley and Picard are actually quite good!—but it's hard to understand what the hell he was trying to accomplish with the colony that looks like a hastily built My First Adobe Village on a soundstage. The planet's inhabitants are a pastiche of 1950s-era "Cowboys and Indians" antagonists, and once they start nagging Wesley about pantheism and how he needs to get his Space Peyote on and do a "vision quest," I was ready to pull the eject handle and bail out. The Indians mostly have long hair. They wear hybrid Native-meets-Renaissance clothing. They speak normally--perhaps a bit too formally--with a smattering of spiritual mumbo-jumbo. In other words, they're not quite modern like the Federation visitors, but they're not quite stereotypical either. In fact, they're like almost every other "alien" race in Star Trek. Their faces and hair, clothing, and mannerisms diverge slightly from the Federation norm--enough to mark them as different without requiring any real effort. Dorvan V's tribe isn't named and has no specific culture. Are these people Cherokee, Navajo, Haudenosaunee, Ojibwe, or what? These tribal groups aren't the same thing--in fact, they're quite different--so it matters. The colony may be a pan-Indian agglomerate of several cultures. But then the people wouldn't act in unison, as if they had one set of sacred beliefs, so that isn't plausible. I imagine the colonists were meant to be a single culture, but the writers were too ignorant or scared to come up with something specific. The village does look like "My First Adobe Village," but that's pretty much true of every alien race visited by the Federation. Presumably the budgets required that every outdoor scene looked like it was filmed on a "primitive village" set. Probably the worst bit is the so-called "vision quest" in the Habak--whatever that is. One, the room has a jumble of Native artifacts from different cultures. That's flatly wrong. Two, vision quests typically involve going off into the wilderness and fasting for four days. They're not the same as any supernatural event involving Natives and visions. Vision quests aren't a part of every Native culture. And they don't occur in four-walled rooms with artifacts. The whole thing is patently phony. Compounding the problem, the Indian leading the vision quest, Lakanta, turns out to be the non-Native Traveler. This implies Native religion is the same as or similar to alien science-magic. It belittles such religion by suggesting a sufficiently advanced alien could imitate or even become a Native spirit. If a Christian prophet performing miracles turned out to be an alien, would that be an acceptable commentary on Christianity's authenticity? Because this is kind of the same thing. In terms of stereotyping, Journey's End is fair to poor. The Indians aren't much better than the ones in 1960s Westerns like Bonanza, which also portrayed them sympathetically. Indeed, I'd say the relocation debate is more interesting than the pseudo-Indians. It might've been better to invent a fictional culture rather than give us this mishmash of Indian ideas and concepts. I didn't watch Saved by the Bell when it was on the air. But every long-running show has to have an "Indian" episode, it seems, and Saved by the Bell had one too. 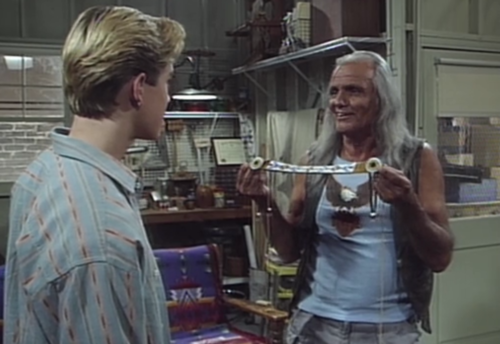 Running Zack (24 Nov. 1990)If Zack wants to run the track meet, he better prepare his ancestry report where he gets help from an Indian.Running ZackZack fails his family heritage presentation. Unless he can make it up, he is off the track team. His teacher Miss Wentworth arranges a tutor for Zack named Chief Henry, who happens to be a Native American. Zack soon learns about his own Native American heritage, but does not feel like going to the upcoming track rally when tragedy strikes.From what I read, fans seem to think Running Zack was one of the worst episodes ever. The whole series seems to be written for juvenile pre-teens, but I don't think Running Zack is worse than other Native-themed episodes I've seen. I'd say it's mediocre rather than terrible. Miss Wentworth's students have to do a family-tree presentation, which involves talking for 30 seconds in front of the class. That's more like something you'd do in 3rd grade than in high school, but hey...this is a compressed TV sitcom, so never mind. Zack finds an old photo of an Indian. 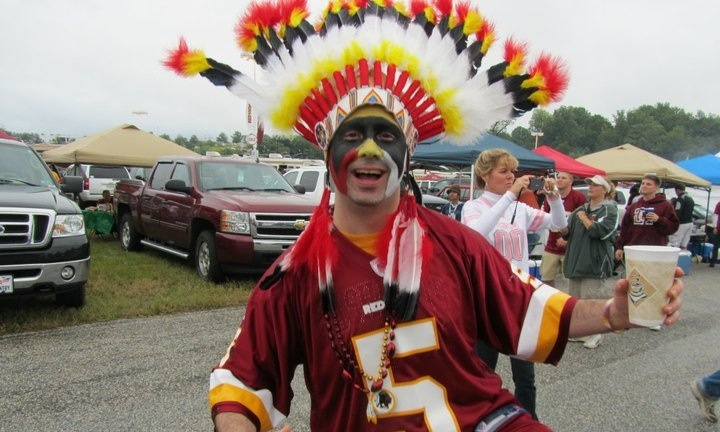 His mother told him the Indian was a distant relative. That's good enough for Zack to base a half-assed report on. This is roughly the rationale given by wannabes such as Ward Churchill, Elizabeth Warren, and Johnny Depp. Claiming Native ancestry based on a hypothetical ancestor in one's family lore is common. If a kid is lazy and doesn't do his homework, he could easily seize on such a story for a class report. A couple of people said Zack is clearly Nordic (or Anglo-Saxon, or Aryan) and couldn't be Native. But he didn't declare himself to be Native because of one ancestor. He could have a distant Native ancestor in his family tree. And since the assignment apparently was to talk about one of his ancestors, he was doing what he was told. Zack gives a perfunctory talk using Screech as his assistant. Zack draws "war paint" on Screech and gives him a toy tomahawk. Screech stands like a cigar-store Indian and talks like Tonto. Yes, it's a stereotypical if not racist presentation. But Zack is supposed to be ignorant about Indians at this point. Since Running Zack aired two years before Dances with Wolves, and kids are still dressing and acting this way today, it's not an terribly unbelievable report. Many people, especially naive youngsters, really are this dumb and foolish. Miss Wentworth sends Zack to meet her friend Chief Henry. The critics wondered how they could've met. Perhaps at UCLA, since he said he went there. It's totally normal to meet Indians in everyday life, especially in an urban environment such as Los Angeles. The real issue isn't how they met, but why people are questioning it. Critics also wondered about his "Chief Henry" name. Yes, it's a stereotypical name for someone who isn't a chief. But it could just be a nickname. If that were the only problem, I'd call the episode a success. More important than these points is the overall impression Henry makes. He's played by Dehl Berti, a Chiricahua Apache actor. That's good; no redface casting here. He dresses and acts like a beach bum, not a wise elder or shaman. He punctures Zack's ignorance about Indians several times--for instance, saying he learned beading in a class at UCLA, not from his elders. Except for the minor details noted above, and too many Native artifacts lying around, I'd say this is an above-average TV portrayal. In fact, I'm not sure I can think of a better one in a sitcom before 1990. Zack finds his ancestor's photo in a book and goes back to Chief Henry to learn more. Again, the Indian confounds Zack's expectations. Henry gives Zack a beaded headband and the name "Running Zack" before heading out to surf. Critics complained that Running Zack is a stereotypical "Indian name." True, but Henry knew Zack was a runner. I think Henry was playing with Zack--giving him a faux name to match his hobby. I don't think it was supposed to be a genuine naming ceremony. Zack does a makeup presentation in a full buckskin costume, headdress, and warpaint. This is perhaps the most offensive thing in Running Zack. He's read the books and learned about his ancestor...but he still comes to class in the most stereotypical outfit possible? He apparently hasn't learned a thing about how Indians look. Despite the ridiculous outfit, Zack gives a decent summary of his ancestor, who turns out to be Chief Joseph of the Nez Perce. Zack names a real Indian from a real tribe and gives his real history, including his "I will fight no more forever" line. That's a nice dollop of history for a lowbrow comedy. It's more than you'll get from most shows, even today, with their no-name or fictional tribes. Chief Henry dies suddenly. The critics asked why. It could be anything--it doesn't matter what. The critics said Zack didn't know him long enough to grieve. True, but sometimes you can connect deeply with a person in just a few minutes. This was clearly meant to be like that. Again, compressed sitcom. I think the episode wanted us to imagine Chief Henry had two long soulful meetings with Zack. That they didn't appear on screen is a limitation of the format. Chief Henry's ghost visits Zack while he's asleep. He's dressed in a white suit and talks about getting his wings and enjoying his afterlife. Critics said that sounded like Christianity rather than a Native religion. True, but Henry could've been Christian or a Native/Christian blend. Again, it subverts expectations not to have Henry mouth platitudes about the Great Spirit or the happy hunting grounds. One also could connect the ghost to the idea that all Indians have supernatural powers, but I don't think the show was suggesting that. I took it as more of a dream sequence, even though Zack seemed fully awake. I guess there was a whiff of Indians = supernatural, but not enough to bother me. Other aspects of Running Zack were arguably worse than the Native storyline. Screech's malapropisms and misunderstandings are stupid rather than funny. Jessie's stalking Lisa because Lisa's ancestors were slaves and Jessie's were slavetraders is also stupid rather than funny. No one feels incredible guilt because a few of their ancestors did something bad hundreds of years ago. Let's sum it up. First presentation: Intentionally racist and bad. Meetings with Chief Henry: Good. Second presentation: Bad looks, good words. Meeting with Chief Henry's ghost: Not bad. On a scale of 1-10, I'd call that a 5 or 6. Which means mediocre, not terrible. Overall, Running Zack was poor, but not because of the Indian bits. I think those were some of its more interesting parts. I'd give the episode a grade of C or C-, not an F.
Set in the nineteenth century in Genoa, Nebraska, Off the Rails focuses on Momaday (Shaun Taylor-Corbett), a young boarding school student who has been sentenced to death for impregnating an Irish girl. Brothel owner Madame Overdone (Shyla Marlin), her working girls, and saloon patrons hatch a plot to rescue Momaday. Key to his salvation is his older sister Isabel (Elizabeth Frances), a graduate of a boarding school. To save her brother, Isabel must win the affections of Captain Angelo (Michael Matthys), the new superintendent of the school. Angelo’s Victorian rules for life are threatened by his primal lust when the women in town combine forces to challenge his brief authority and save Momaday. Off the Rails tackles the controversial and rarely discussed topic of Indian boarding schools. Typically absent from our nation’s history books, schools affected generations of Native Americans in unimaginable ways. Culture and identities were stripped, languages lost, lifelong friends were made, and unions were strengthened. Off the Rails dramatizes the polarizing national tensions in an audience-friendly way by combining knee-slapping comedy, vibrant music, and a set that transports theatregoers to 1886. By John SoltesOff the Rails is a learning process even for the actors on stage. Reinholz said they walk away with “empowerment,” particularly for the native actors. Off the Rails is the capstone of an entire year where Native Voices attempted to understand the boarding school system and its implications. The playwright said the adaptation, which is gaining interest from major theater companies, is approximately 20 percent Shakespeare and 80 percent invention. Randy Reinholz is the writer and director of "Off The Rails," which will be presented as part of the Native Voices Series at the Autry National Center in Los Angeles Feb. 25-March 15. By Michelle MillsReinholz, a Chula Vista resident who is also an administrator at San Diego State University, has directed more than 50 plays in the United States, Canada and Australia. Of Choctaw ancestry, he is focusing on raising awareness of the Native American experience. He also seeks to open eyes to the versatility of Native Americans, especially on stage. In turn, Reinholz said that the Native Voices company is diverse, boasting 100 professional performers, many of whom are multiracial. “Off the Rails” alone has a cast that includes actors who are full-blooded Native American and of mixed European and Native American descent, as well as African-Americans, Chinese and Anglos. By MarkOff the Rails delivers all this lightly and rapidly, with combustible humor. Led by veteran Ted Barton as the town’s absent eminence, and Shyla Martin as the bordello keeper, the cast carves out clear characters and delivers the lines—old and new—with unfailing energy and clarity. Christopher Salazar is especially strong as a wise aide, Román Zaragoza and Robert Vestal create a charming pair of scapegraces, and LeVance Tarver holds stage winningly as a chorus cowboy. Brian Joseph provides beautifully apt music. And of course Native Voices has Grandfather (Duane Minard) lending his dignity and blessing. At times, the exuberance runs a bit off the rails, with almost constant movement (note to director Chris Anthony: Still moments run deep) and some odd, unmotivated blocking. But that’s a small matter. By Deborah KlugmanIt's a lighthearted play with music, as opposed to a serious drama. But Off the Rails has plenty worthwhile to tell us about the cultural genocide perpetrated on Native Americans by a school system designed to indoctrinate and control. Under white governance, the community was ultimately fractured. We see this illustrated in the rift between Momaday and Isabel — one a traditionalist, the other a newly converted Christian. Though all the performances are capable, the best of them emerge from the supporting ensemble. Under Chris Anthony's direction, they include the versatile and very funny Barton, who, besides the pompous general, plays a mentally suspect French executioner; Christopher Salazar as a decent government official dismayed by Angelo’s doings; and Robert Vestal as Pryor, the smart-aleck who takes over the saloon and brothel after Angelo declares that women—in this case Madame Overdone—may no longer own a business.And a mini-review from Facebook:Awesome cast. Sold out show! Wonderful moments, comedic and in all seriousness--reflective of an infinitely different attitude toward Native Americans than today. Happily so:). Wonderful singing and instrument playing with old friend Duane Minard, beautiful Shyla Marlin, young talented man I met as an infant Roman Zaragoza, and one of my favs Robert Vestal as [a] major comedic character with a twist.